We aim to include a maximum number of countries in the Report every year, within the constraints posed by data availability. To be included in the Report, a country must have data available for a minimum of 12 indicators out of the 14 that make up the Index. In 2015, we have been able to include 145 countries in the Report. Of these, 109 have been included in the Report since the first edition published in 2006. Nearly 200 countries were considered for inclusion this year. Out of the 145 ultimately covered in this Report, 19 countries had one data point missing and 31 countries had two data points missing. Missing data is clearly marked on each relevant Country Profile. Last year we included 142 countries in the Index. This year, we were able to include three new countries—Benin, Cameroon and The Gambia —resulting in a total of 145 countries. Figure 1 is a global snapshot of the gender gap in the four subindexes. It shows that the 145 countries covered in the Report have closed almost 96% of the gap in health outcomes between women and men and 95% of the gap in educational attainment. However, the gap between women and men on economic participation and political empowerment remains wide: only 59% of the economic outcomes gap and 23% of the political outcomes gap have been closed. Table 3 displays the 2015 index and subindex rankings, organized from highest to lowest by rank, on the overall index. No country in the world has fully closed the gender gap, but four out of the five Nordic countries and Ireland have closed more than 80% of it. Yemen, the lowest ranking country has closed over 48% of the gender gap. For further analysis of countries, refer to the Country Results section. Figure 2 illustrates the spread of country scores for the overall Index. The population-weighted global average is highlighted by the blue diamond. Iceland holds the top spot, followed closely by Norway and Finland. At the other end are Pakistan, Syria and Yemen, which is the lowest-scoring country in the Index. Table 4 displays the rankings by subindex, organized highest to lowest by rank per subindex. In 2015, 25 countries have fully closed the gap on the Educational Attainment subindex, the same number as the last two years. Angola, Yemen, Guinea, Benin and Chad hold the last five spots on this subindex, with Benin and Chad having closed less than 70% of their education gender gap. In total, there are 21 countries where women still have less than 90% of the education outcomes that men have. Thirty-five countries are below world average (weighted by population) on this subindex. While the Index takes into account four key indicators to measure the gender gap on education outcomes, the Country Profiles provide additional information on the gaps between women and men, on out-of-school children of primary school age, education attainment rates, STEM education and PhD degrees. Forty countries (five more than last year) have fully closed their gender gap on the Health and Survival subindex. Mali, Albania, India, Armenia and China are the lowest-ranked countries, and no country currently has a gap bigger than 90% on this subindex. Only nine countries are below world average (weighted by population) on this subindex. While the index takes into account two key measures of gender gaps, this year we are presenting additional contextual information in the Country Profiles that reveals differences between male and female outcomes from cardiovascular disease, cancer, diabetes, respiratory disease, HIV, malaria, tuberculosis and malnutrition. Additionally, the Country Profiles contain detailed information on maternal health and fertility. 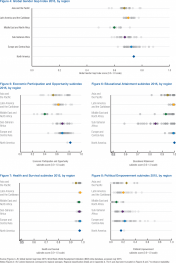 While 10 countries—Austria, Bahamas, Brazil, France, Finland, Guyana, Latvia, Lesotho, Nicaragua, and Namibia—have fully closed the gap on both the Health and Survival and Educational Attainment subindexes, no country has closed either the Economic Participation and Opportunity or Political Empowerment gaps. On the Economic Participation and Opportunity subindex, 14 countries, including four from Sub-Saharan Africa and five from Europe and Central Asia, have closed more than 80% of the gap. Norway, Barbados, Burundi, Sweden and Iceland occupy the top five spots on this subindex. Sixteen countries have closed less than 50% of the economic participation and opportunity gap, including 11 from the Middle East and North Africa region. Iran, Jordan, Pakistan, Syria and Yemen hold the last five spots on this subindex. 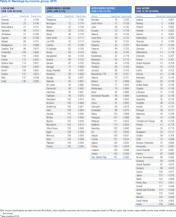 Thirty-one countries are below world average (weighted by population) on that subindex. The Country Profiles include further data on employment and leadership, such as part-time employment, workers in informal employment or the percentage of female top managers. On the Political Empowerment subindex, only Iceland and Finland have closed more than 60% of the gender gap; 39 countries have closed less than 10% of the gap. 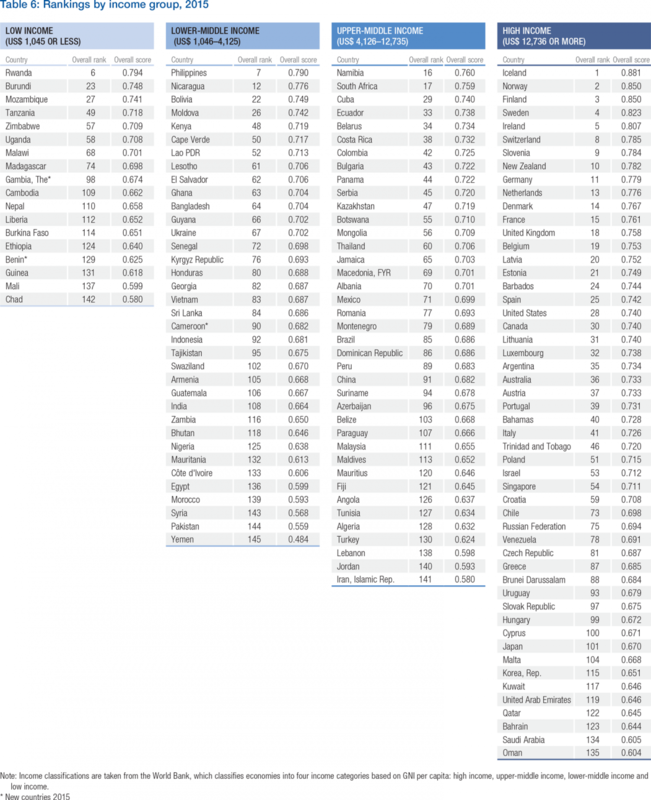 Yemen, Kuwait, Oman, Lebanon, Qatar, and Brunei Darussalam have the lowest rankings on this subindex, having closed less than 3% of the political gender gap. 101 countries are below world average (weighted by population) and Brunei Darussalam still has a score of zero on that subindex, with no representation of women. The Country Profiles also present detailed information on parliamentary quota type and voluntary political party quotas. Figure 3 illustrates the range of country scores for the four subindexes. The population-weighted average for each subindex is highlighted by blue diamonds. Health and Survival is the closest to reaching universal gender parity, followed by Educational Attainment, Economic Participation and Opportunity, and, lastly, Political Empowerment. 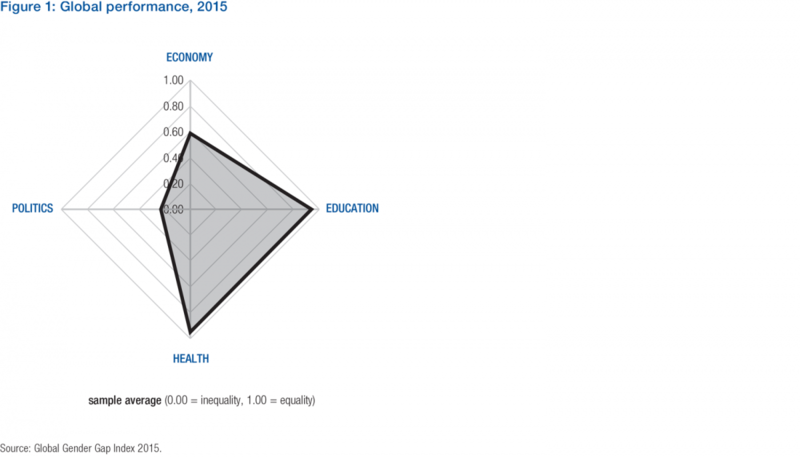 The widest range in scores is found on the Political Empowerment subindex, followed by Economic Participation and Opportunity. Norway tops the Economic Participation and Opportunity subindex and Yemen is the worst performing country. Chad clearly lags behind the rest of the world on Educational Attainment and China is the worst performing country on Health and Survival. Iceland tops the Political Empowerment subindex, followed by Finland and Norway. Brunei Darussalam is the worst performing country in this subindex, with a score of 0. Table 5 displays the rankings by regional classification, organized by rank within each regional group. In 2015, eight out of the 24 countries from Asia and the Pacific have closed over 70% of the gap, with the Philippines, New Zealand and Australia in the lead. 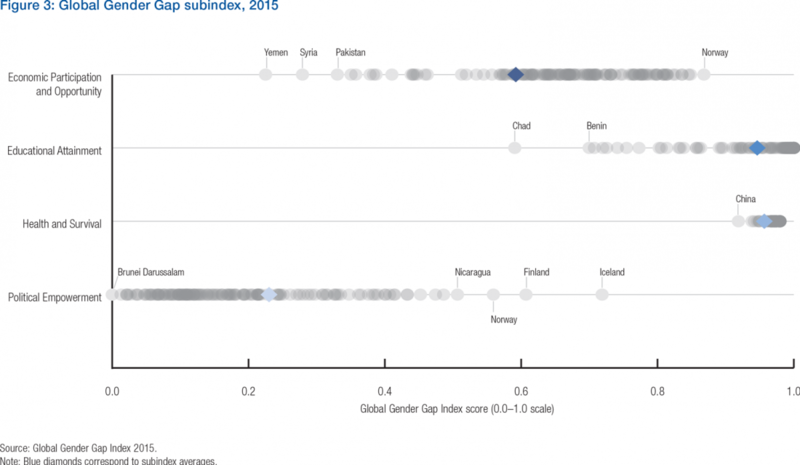 At the bottom end of the rankings, two countries from the region—Iran and Pakistan—have closed less than 60% of the gender gap. In Latin America and the Caribbean, 14 of the 26 countries in the region have closed over 70% of the gender gap. Nicaragua, Bolivia and Barbados occupy the top three spots. The lowest-ranked country in the region—Paraguay—has closed a little over 65% of its gender gap. In the Middle East and North Africa region, only Israel has closed over 70% of the gender gap, while six countries have closed less than 60% of the gender gap. Canada and the United States have both closed nearly 75% of the gender gap. In Sub-Saharan Africa, out of 28 countries covered, 14 have closed over 70% of the gender gap, with Rwanda, Namibia and South Africa in the lead, while two countries—Mali and Chad—have closed less than 60% of the gap. In Europe and Central Asia, out of 46 countries, five countries have closed over 80% of the gap, while 15 countries have closed less than 70%. Figures 4 through 8 show the range of scores for the overall Index and the four subindexes by region. In addition population-weighted group averages are provided in each figure. 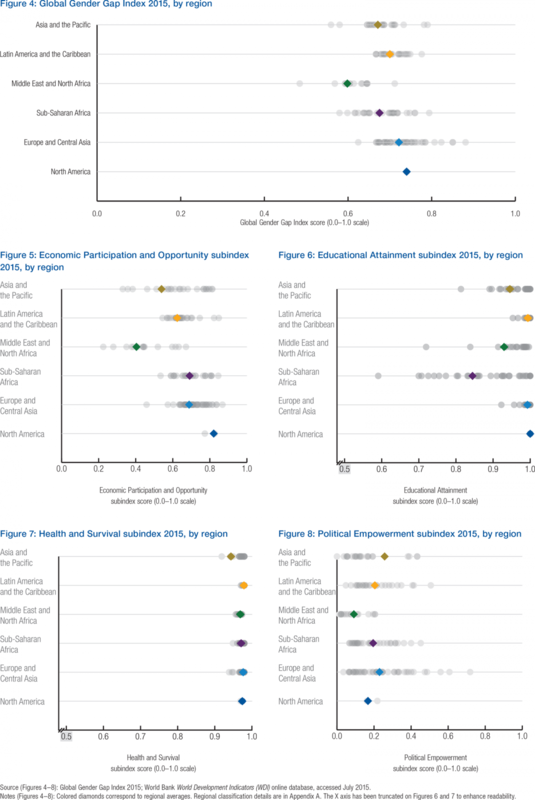 Readers should note that the figures for the Global Index, Economic Participation and Opportunity subindex and Political Empowerment subindex display the full scale of 0.00 to 1.00 while the figures for the Health and Survival and Educational Attainment subindexes display the scale from 0.50 to 1.00 in order to improve visual clarity. This particular distinction in scales for the four subindexes is used in all relevant figures in this chapter. Figure 4 shows the range of country scores within each region as well as regional averages on the overall Global Gender Gap Index. North America holds the top spot, with the United States and Canada at almost the same score. Europe and Central Asia is next with a wide spread among the 46 countries covered. The Latin America and the Caribbean region follows, with a regional group average of just over 70% of the gap being closed. Next is Sub-Saharan Africa, followed by Asia and the Pacific. Last in order of average scores is the Middle East and North Africa. 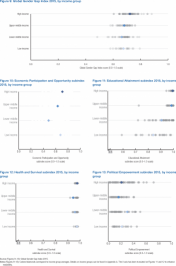 Figure 5 displays the Economic Participation and Opportunity subindex results by region. North America has the highest average score (82% of its economic gender gap is closed), followed by Sub-Saharan Africa, Europe and Central Asia, Latin America and the Caribbean, Asia and the Pacific and Middle East and North Africa, where only 40% of the economic gender gap has been closed. There are significant variations within regions, with clear laggards and leaders. Figure 6 displays the Educational Attainment subindex results by region. North America is again in the lead, followed by Latin America and the Caribbean and Europe and Central Asia. Each of these regions has closed over 99% of the gender gap. Asia and the Pacific and Middle East and North Africa follow next, having closed, respectively, 95% and 93%of the education gender gap. The lowest average comes from Sub-Saharan Africa at 84%. Figure 7 displays the Health and Survival subindex results by region. While all regions are close to parity, differences in averages are driven primarily by a few underperforming countries in some regions, particularly in Asia and the Pacific, Sub-Saharan Africa and Europe and Central Asia. Figure 8 displays the Political Empowerment subindex results by region. In terms of averages, the highest-ranking region is Asia and the Pacific (26% of its political empowerment gender gap is closed), followed by Europe and Central Asia (23%), although the three highest scoring countries are in Europe and Central Asia. In order of regional averages, Latin America and the Caribbean (20%), Sub-Saharan Africa (19%), North America (17%) and Middle East and North Africa (9%) follow next. Table 6 displays the rankings by income group (Table A2 in Appendix A displays the income group categories used). In 2015, among the 52 countries in the high-income group, the Nordic countries lead the way while Bahrain, Saudi Arabia and Oman are the lowest performing countries in this category. Among the 39 countries in the upper-middle income group, Namibia, South Africa, Cuba, Ecuador and Belarus lead the way; Algeria, Turkey, Lebanon, Jordan and Iran occupy the last spots. In the lower-middle income group, out of 35 countries, Philippines, Nicaragua, Bolivia, Moldova, and Kenya take the top five places, whereas Morocco, Syria, Pakistan, Yemen and Zambia occupy the last five spots. In the low-income group, out of 18 countries, Rwanda, Burundi, Mozambique, Tanzania, and Zimbabwe come out on top and Ethiopia, Benin, Guinea, Mali and Chad hold the last spots. Figures 9 through 13 show the range of scores for the overall Index and the four subindexes by income group. In addition, population-weighted group averages are provided. Figure 9 shows the range of country scores within each income group as well as income-group averages on the overall Global Gender Gap Index. High-income countries have the highest average score (72%), followed by upper middle-income countries (68%), low-income countries (68%) and lower middle-income countries (nearly 66%). Figure 10 displays the Economic Participation and Opportunity subindex scores by income group. High-income countries (71%) are again in the lead, followed by low-income countries (68%). Next are upper middle-income countries (63%) and in the last place are lower middle-income countries (49%). Figure 11 displays the Educational Attainment subindex scores by income group. High-income countries have nearly closed the gap in education (99.5%) while upper-middle income countries are close behind (98.4%). Lower-middle income countries, however, have more mixed performance, with countries that have fully closed the gap as well as countries that have closed just a little over 70% of it and a mean of 90.6%. Low-income countries are farthest behind at 84%. Figure 12 displays the Health and Survival Subindex scores by income group. All income groups, except the upper-middle income group have closed over 95% of the health gap, with high-income countries in the lead followed by low income, lower-middle income and upper-middle income countries. Because the averages are weighted by population size, and in an otherwise fairly homogenous subindex, India and China’s poor performances in the upper-middle and lower-middle income categories drive the income group order by average. Figure 13 displays the Political Empowerment subindex scores by income group. 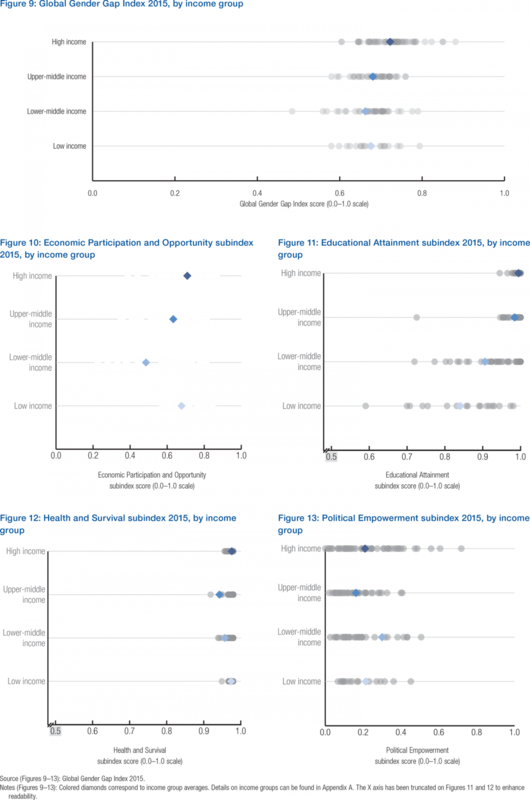 Lower-middle income (30%) and low-income (21.4%) countries trump high-income (21.0%) countries by a few decimal points and upper-middle income (16.3%) countries on Political Empowerment averages by income group. Nonetheless, the highest scoring country on this subindex belongs to the high-income group. 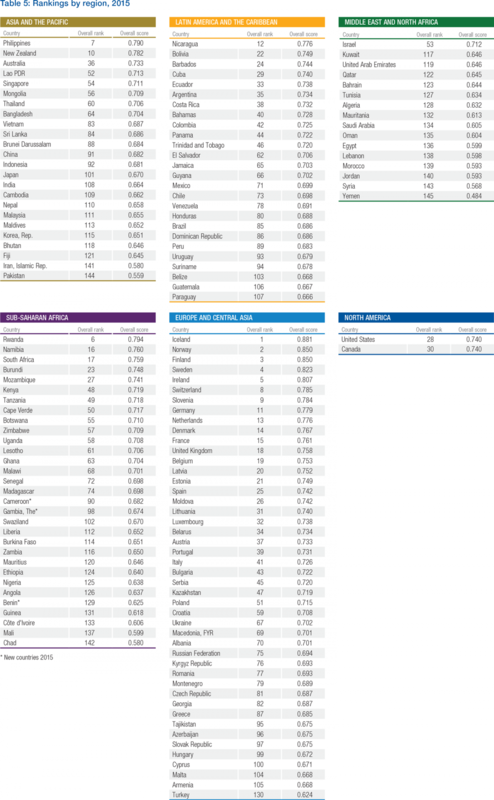 Appendix B illustrates the spread in 2015 of the data for male and female values for all 14 indicators used in the Index in a single visualization. 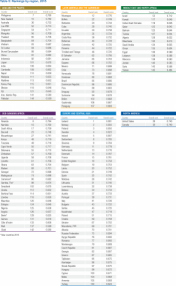 Appendix C contains detailed data tables, in rank order, for all 14 indicators included in the Index for all countries where data was available in 2015.